We used to say, or at least think, this phrase whenever we drove past an RV that was broken down alongside the road. Our number came up last Tuesday, the 18th, in the early afternoon, when we were about 15 miles south of Ashland, WI on Highway 2. First, the “Engine Malfunction” light came on our RV’s dash followed shortly thereafter by the red “Stop Engine” light. Very bad mojo because we were stopped dead. We tried calling Coach-Net, our roadside assistance, to get help, but our cell phones could’t get a signal. Great. So I unhitched our Jeep from the RV and started driving towards Ashland, hoping to get a decent cell signal. Sixteen miles later in downtown Ashland I was able to get a consistent three bars on my phone, and I was able to call Coach-Net. Though it took a few calls, Coach-Net was able to arrange for a tow for our RV. 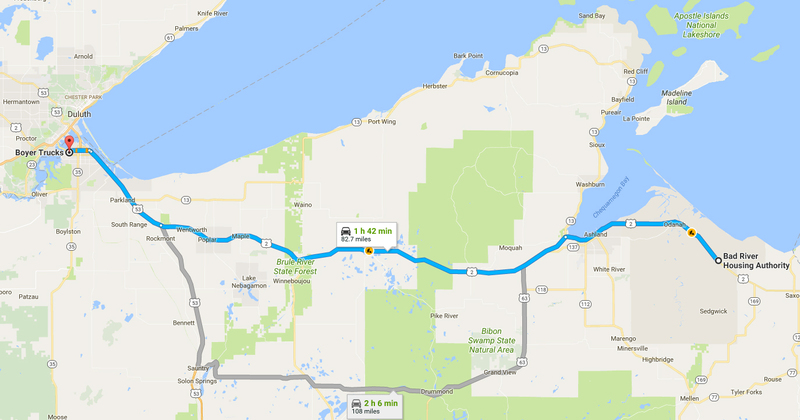 However, the nearest service center was in Superior, WI — over 80 miles away. Our tow showed up about 7 pm. 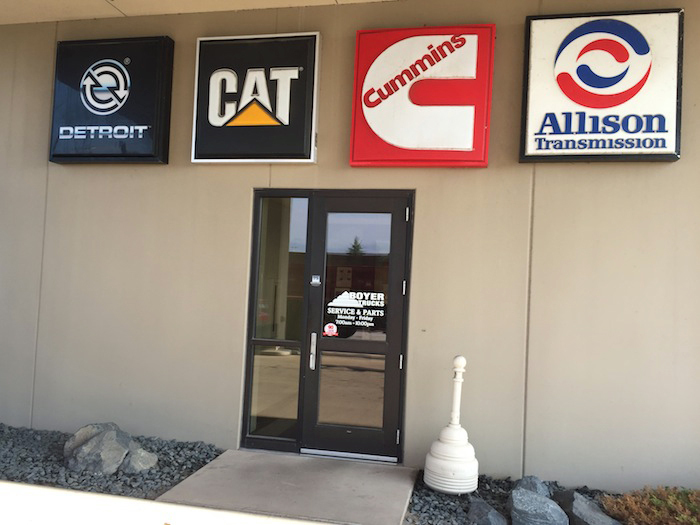 We arrived at Boyer Trucks in Superior about 9 pm. Who’s tired? We were. Boyer stays opened until 10 pm so we were about to talk to someone about our RV. 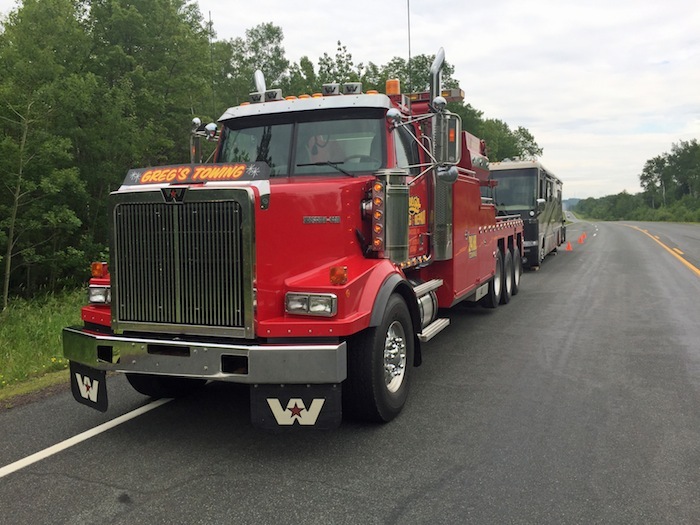 Our tow driver said it was probably something electrical, like a computer malfunction. We were hopeful. 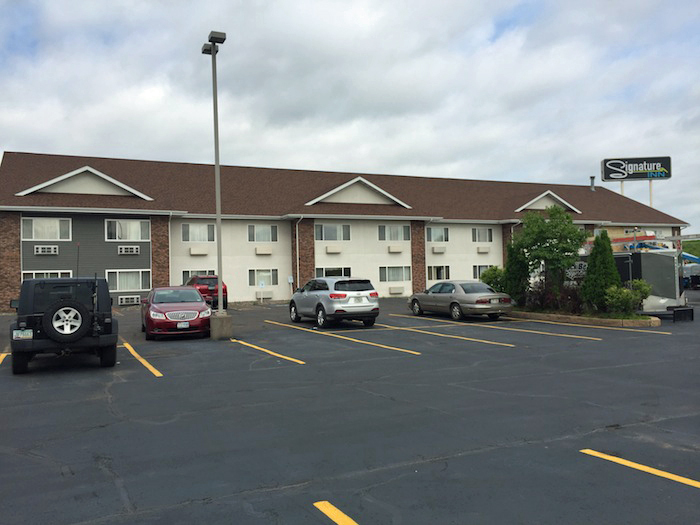 Luckily, we found a good motel right down the road — within walking distance of Boyer. We found out later that the hotel offers discounts to folks getting service at Boyer Trucks. We caught a break. I think it was last Thursday when we found out that our engine head gasket needed replacing. About 30 hours of labor + parts. Hint: the labor is the expensive one. 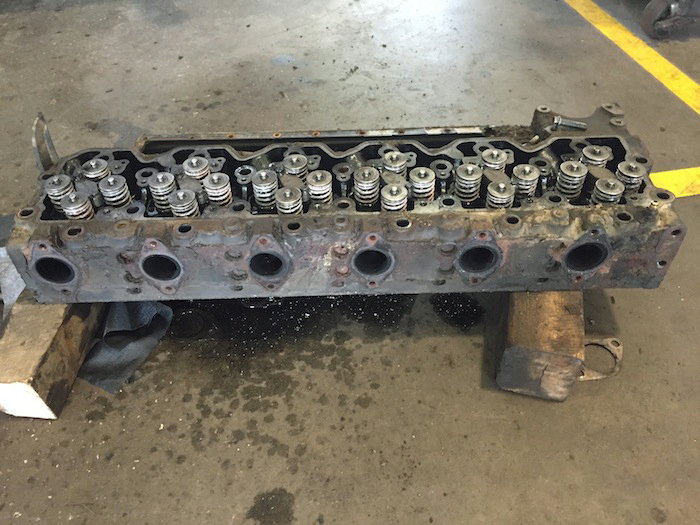 Then on Friday morning Boyer told us the the entire engine head needed to be replaced. 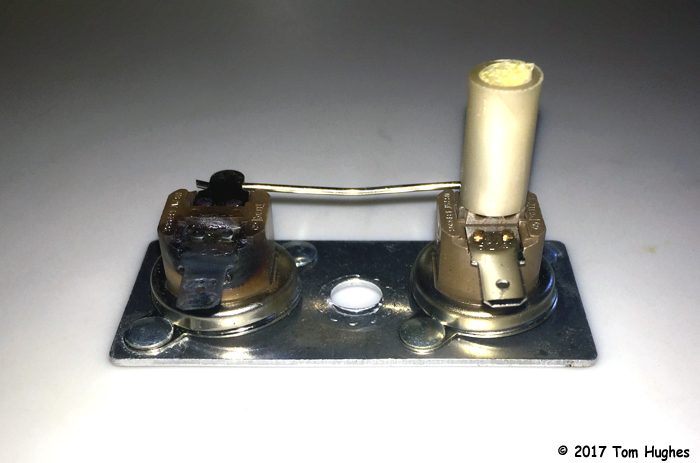 From what we can gather, the former owner left the RV sitting for a while because rust ended up invading the engine head and corroded all the freeze plugs. The news was the equivalent of learning that your house needs a new roof. So we’ve been stranded in Superior for a week. This morning we leaned that our new engine head has arrived so we might be on our way tomorrow or Thursday. Nevertheless, we’ve made the best of our Superior stay . 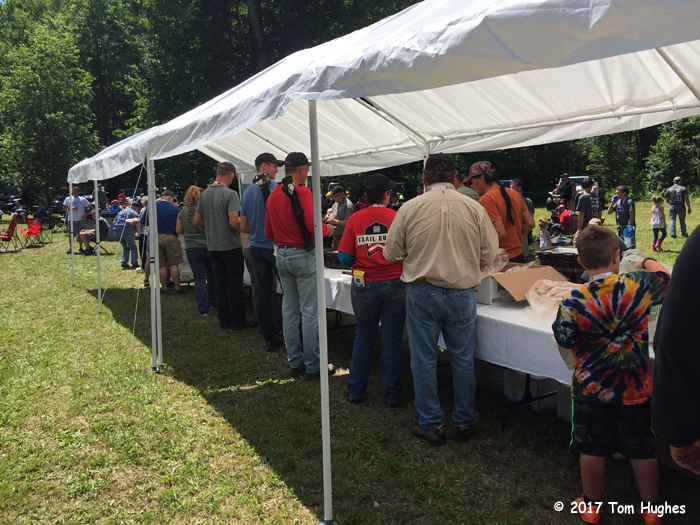 . .
We attended our first Jeep Jamboree this weekend — the 22nd Mole Lake Jeep Jamboree near Crandon, WI. 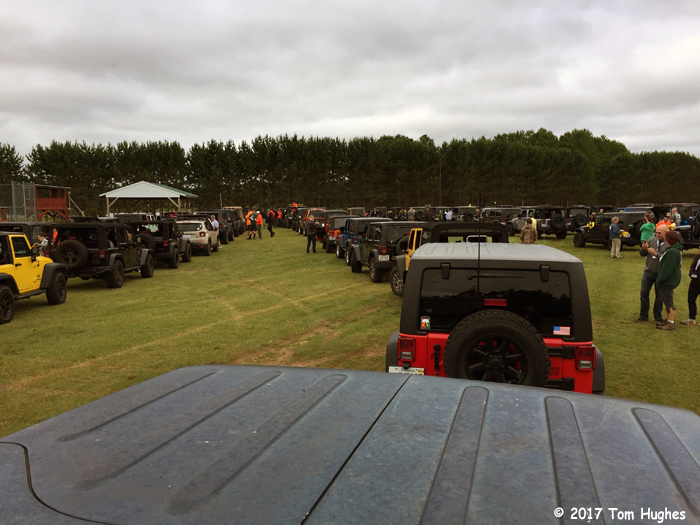 There were 101 jeeps and over 200 riders. Fantastic, but it nearly killed us! More on this later. 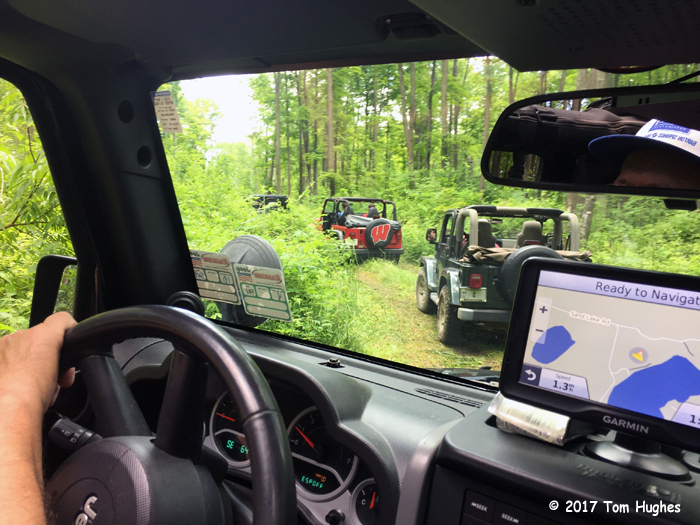 First, basically a Jeep Jamboree is an event to test your jeep and your driving skills over trails rated for varying levels of difficulty rated 1 to 10 (1 the easiest, 10 the hardest). We picked the Green Trail (level 2-3) for the first day and the Blue Trail (level 3-4) for the next day. There were two other trails: Red (level 4-5) and Orange (level 5-6) which we felt were out of our league. 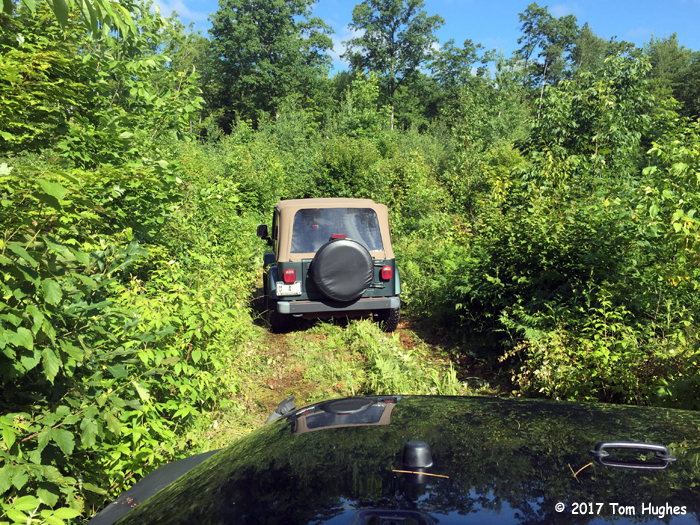 Green Trail — This trail contains numerous hills, some rocks, logs and some tight turns for all types of Jeeps including two and four door models. All terrain or mud terrain tires are recommended. Tire sizes 30” to 32” also recommended. This trail is offered on both days. Blue Trail — This trail contains slightly above mild to wild terrain with more up graded challenges including off camber on hills, climbing rocks and maneuvering between the trees in the woods. Tire sizes 31” to 33” recommended. This is also a good fit for longer wheel based Jeeps. Lockers and lift is helpful, but not required. Terminology: “lockers” — some jeeps (like our Rubicon) have front and rear wheel lockers. This means when the rear lockers are engaged, the rear wheels move in unison which gives you greater traction, likewise for the front lockers. 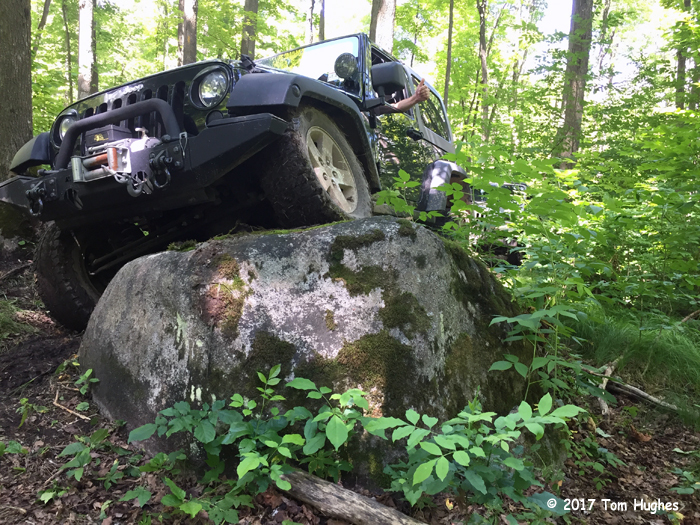 “Lift” typically means that your jeep has large tires and a modified suspension that can lift the jeep up to several inches off the ground. 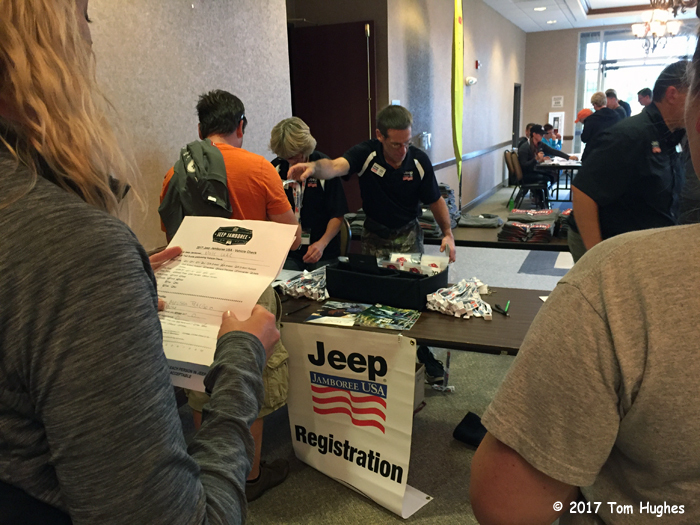 The Jeep Jamboree was a 3-day event. Here’s what happened . . .
We registered at the Mole Lake Casino where breakfast and dinner were also served. In order to eat breakfast at the Casino, we got up at about 6 am, fed and de-pooped the dog, then drove to the Casino which was about 20 miles away from our current campground. 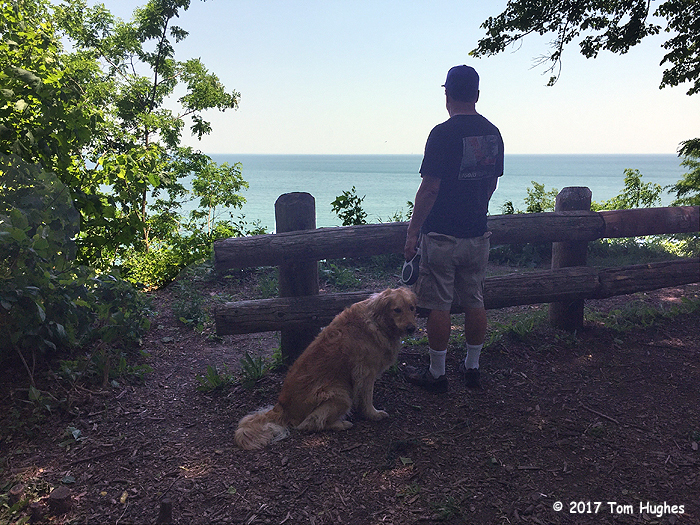 The schedule was 9 to 12 pm on the trail, lunch, then back on the trail from 1 – 4 pm. So 6 hours of driving in the woods. It started off easy enough. They delivered lunch on the trail. Very cool. We took a moment to check out the jeeps again . . .
After 3 hours of driving, I really really really wanted an automatic transmission and was getting very tired of manhandling our manual transmission. By the way, in 6 hours of driving, we covered maybe 5 miles. I wasn’t alone in struggling. A woman, accompanied by only her two dogs, drove the trail in a Jeep Liberty, a not-really-a-good-trail-vehicle jeep. Near the end of the Green Trail, I encountered my immovable object at The Rock . 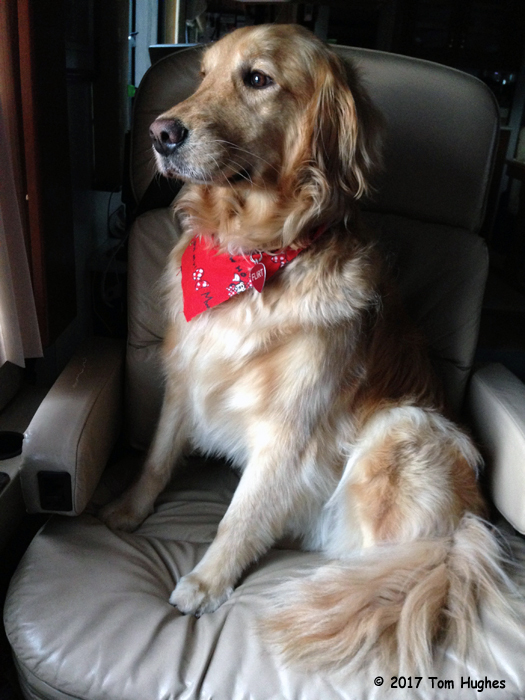 . .
After the Green Trail run, we headed back to our RV . . . Both Jan and I were still tired and I was worried what a more difficult trail might do to our jeep. On Thursday we had several scraping-crunching moments that sounded like they might be expensive. They weren’t, but I didn’t want to chance it. Final thoughts — We loved it. However, we need to add some under body “armor” (like this) to our jeep before we go on another jamboree. Jan is also going brush up on her 4-wheeling skills so that she can drive the trails too. Our Jeep’s transfer case shifter linkage gave up the ghost just as we were preparing to travel to Harrington Beach State Park. This has happened before, and it shouldn’t be a big deal to fix. Fingers crossed. So we’ll try getting it repaired on Monday. 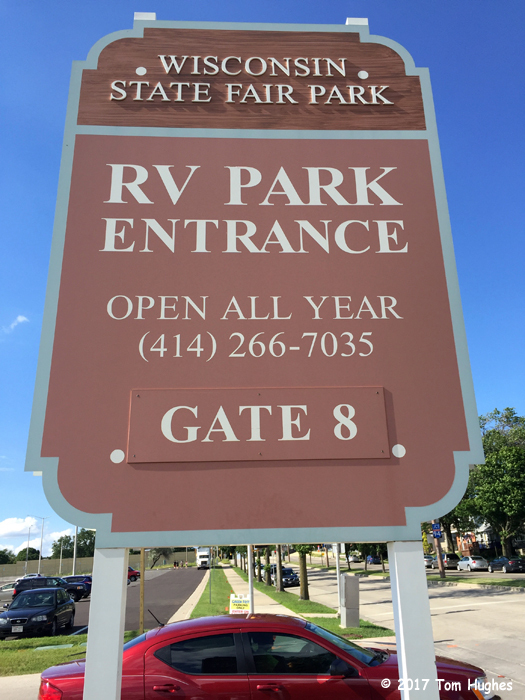 We decided go back to State Fair RV Park (instead of going to Harrington Beach State Park) because State Park is close to several Jeep dealerships. FYI — the Jeep’s transfer case is used to shift into 2WD, 4WD, and Neutral. 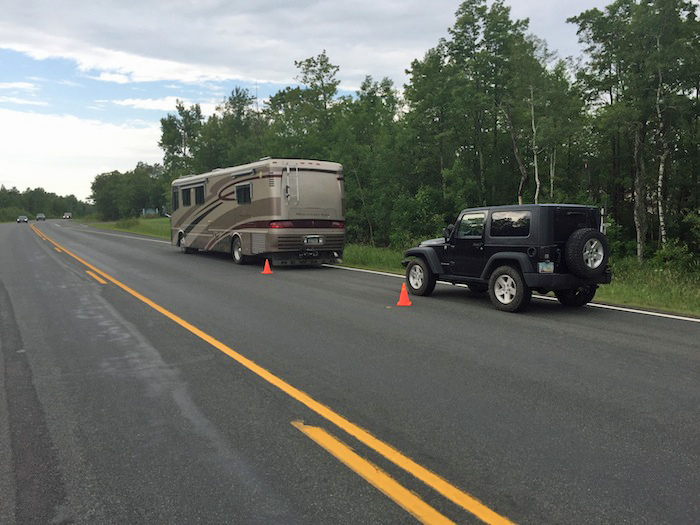 The last one (Neutral) is critical for towing the Jeep behind our RV. If you can’t shift it into Neutral, the Jeep can’t be towed. However, since the Jeep was now “stuck” in 2WD, we could drive it normally. 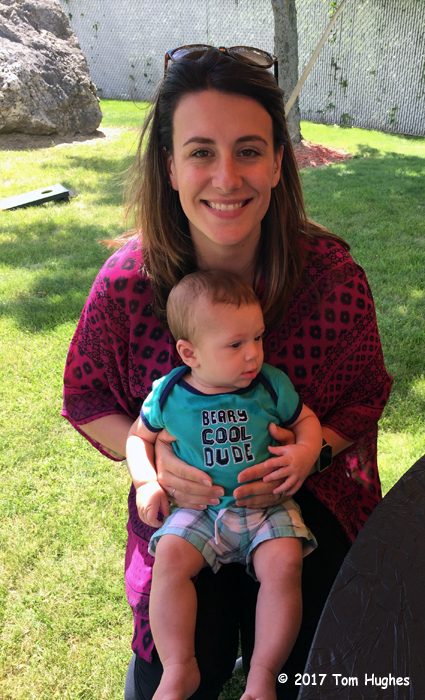 We attended the high school graduation party of Heather, one of my great nieces. It was great seeing family members who we haven’t seen for several years. 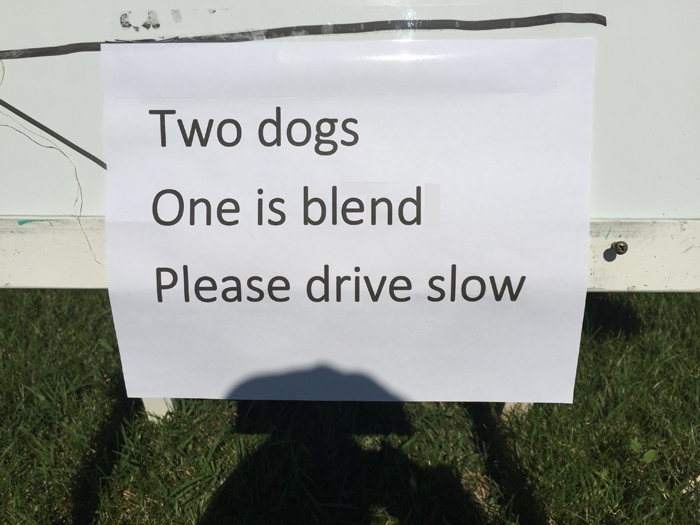 The “blend” dog was Trooper . . .
. . . is almost over. We’re leaving on Thursday. We stayed at site G4, right next to 76th street, which could get very loud, especially on weekends. 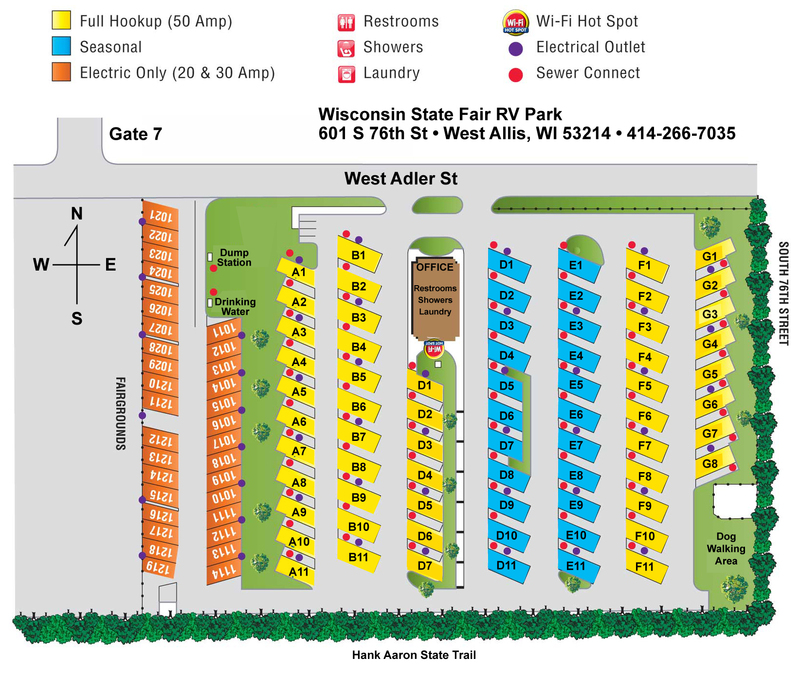 However, Wisconsin State Fair RV Park is a great place to stay if you’re visiting Milwaukee. The park is close to the freeway and the downtown, plus 76th Street can take you to the southern or northern suburbs in minutes. 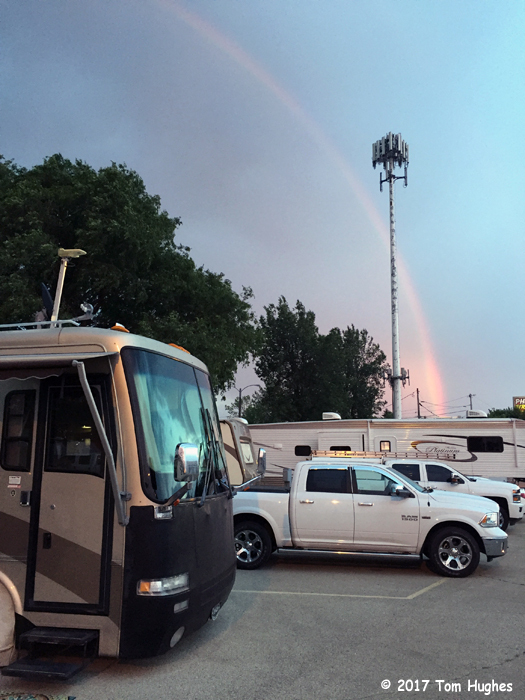 The sites in the State Fair RV park are laid out a bit goofy, but the electric, water, and sewer hookups are solid and the park WiFi is typically 2 Mbps. During our first several days here, there were a lot of thunder storms — even tornado warnings, but nothing severe hit us. Though it looked bad at times . 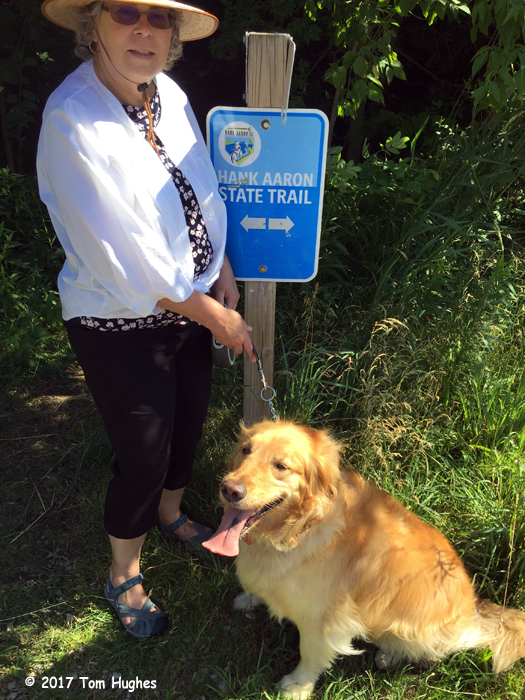 . .
We were right next to the Hank Aaron Trail which is great for walking, dog walking, and bikes. On most nights, the park and the neighborhood were quiet. However, the Milwaukee Mile Speedway is just a few blocks away. There are also festivals held on State Fair Grounds like Greek Fest. There are realy good local places to eat, like one of the Balistreris’s restaurants, but I would not recommend Liquid Johnny’s, a local bar near the state park. 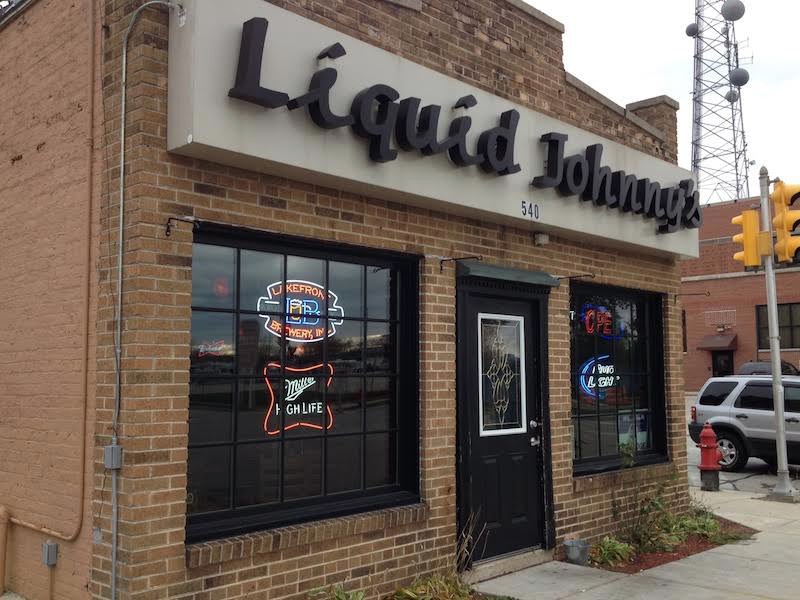 While it has good folks and music, stay away from anything deep fried at Liquid Johnny’s. Following is a list of things we did during our stay . 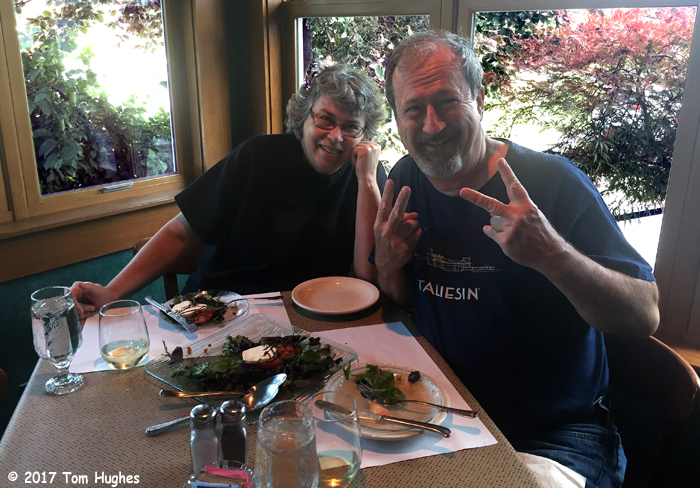 . .
We wrote about Ann’s in a previous posting. We visited my sister Mary who is a Master Gardener at Boerner Botanical Gardens . . . When we lived in the area, we never did this. But now that we’re “visiting”, we took a boat ride on the Edelweiss II . . . When I grew up in South Milwaukee, I used to hang out in this park. Great times. My friends and I used to hunt crayfish below the lagoon falls and walk across the top of the waterfall. We used to go to Hubbard for the Sunday Brunches when we lived in the area. 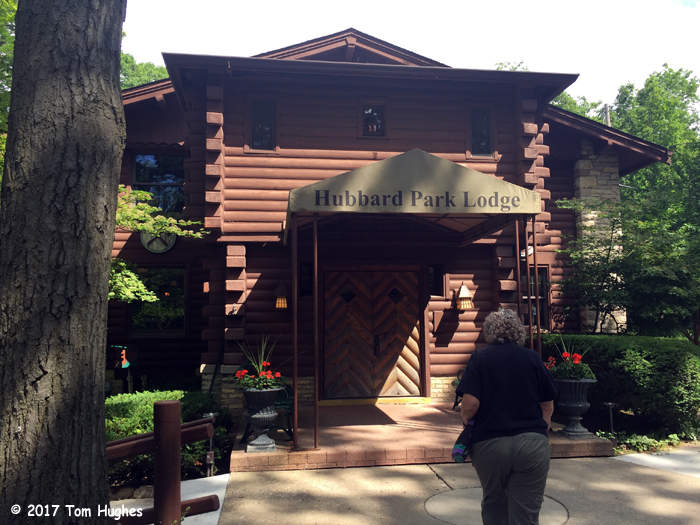 The lodge is located on a bluff overlooking the Milwaukee River . . . When we first arrived in Arizona, we heard the place to go for burgers was In—N-Out Burger. So we tried it. California (where In-N-Out was founded) has great food, but great burgers . . . not so much. You want great burgers . . . and a great dining experience? 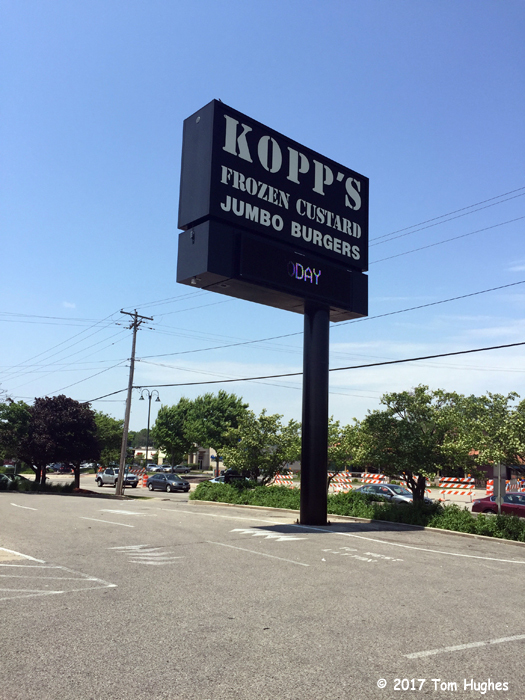 Check out Kopp’s . . .
Like many (most?) kids in the Sixties, I was in a band. A band that actually got out of the basement and/or garage and played in public. We’re all old farts now and it was great getting the band back together again . . . The last time I had Korean food was in 1971 in a little village near Daejeon, Korea. 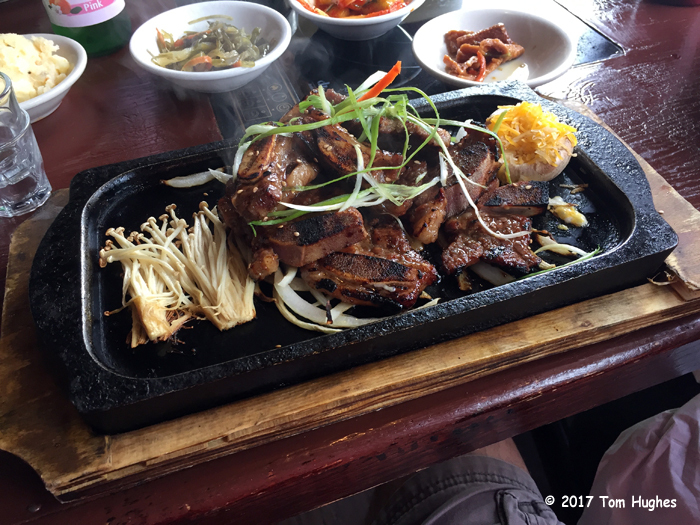 I was in the Army stationed at Camp Ames (now closed) and a local village woman treated several of us to a Korean bulgogi dinner. I think it was good. That dinner was a long time ago so I thought it was time to try Korean food again. So . 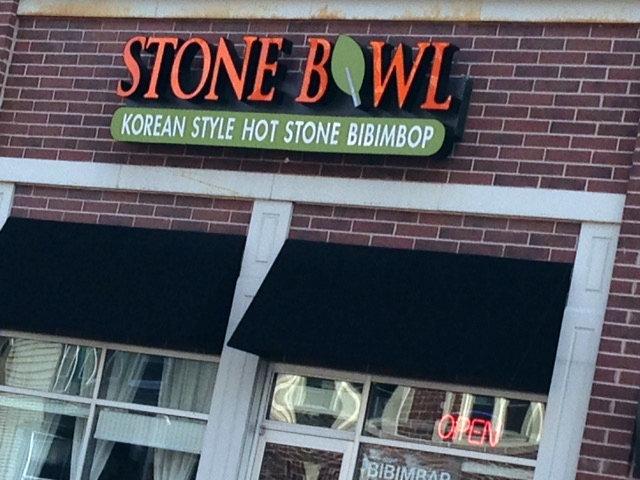 . . Jan and I and my sister Mary decided to have lunch at the Stone Bowl on Milwaukee’s East Side. Here’s the Stone Bowl Menu (PDF). 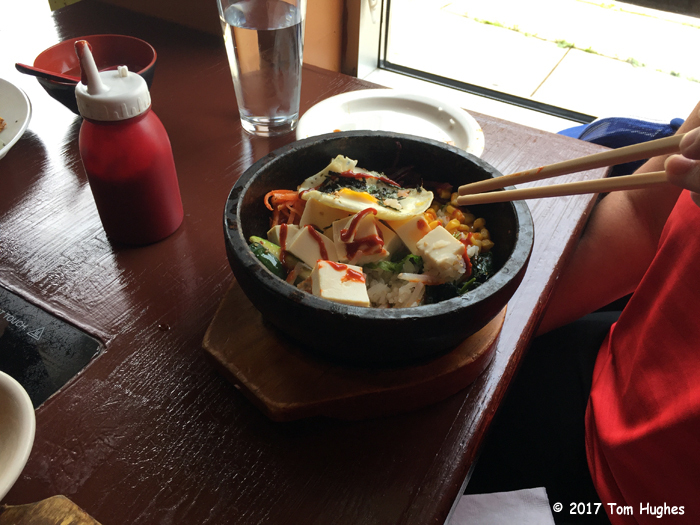 The food met and exceeded our expectations — especially Jan who had Tofu Bibimop and myself who loved the cucumber kimchi. For an appetizer, my sister order Pah-Jeon, a scallion pancake with mixd seafood. Yummmmmmmm. 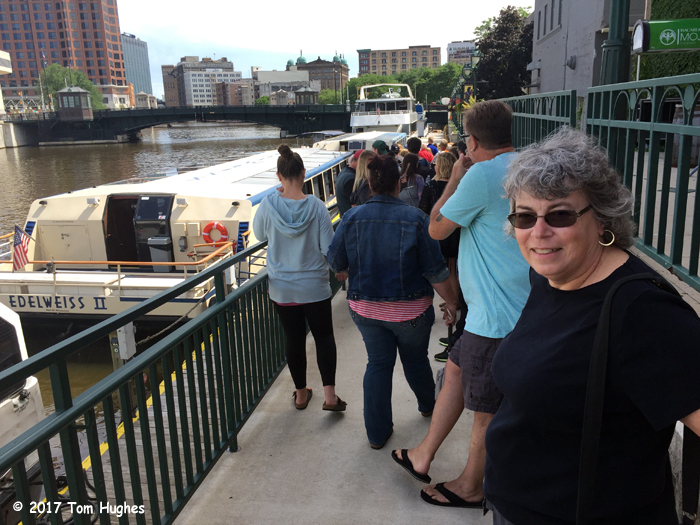 Jan and my sister Mary visited Villa Terrace on Lake Michigan . . .
PARTING SHOTS . . .